The adjustable Davis and Sanford (Tiffin) tripod (with adapter) is recommended as the primary tripod for the 400 mount and Mach 1 mounts. 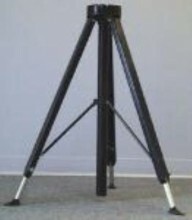 Its light weight and compact size also make it an ideal portable tripod. Constructed of black anodized aluminum and black painted aluminum castings. Click the button below to add the Astro-Physics Adjustable Aluminum Tripod for 400, Mach 1 Mounts to your wish list.